"These are the most delicious lamb chops you'll ever taste! 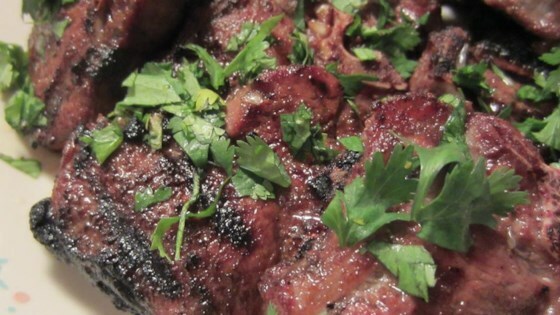 When I make it, this savory lamb dish has impressed EVERYONE and has had people coming back for more for many years. It's suitable for any occasion...even Christmas or Thanksgiving. Plan ahead so you can marinate the lamb overnight." Roast uncovered in the preheated oven to your desired degree of doneness, about 20 minutes for medium, or 30 minutes for well done. Garnish with a sprinkle of cilantro and squeeze lemon and lime juice over the top before serving. We were not very impressed with this recipe. It was too sweet for us. This is one of the best recipes I've ever used for lamb. I think next time I'll leave off the sugar, however. As-is, though, it's still delicious.